An affectionate recreation of the lantern-jawed hero who captured the imagination of 15 million radio listeners after the War, this is a fast-moving pastiche with music (and a few naughty jokes). Derring-do versus dastardly deeds with performances at 7.45pm 10 - 18 December. 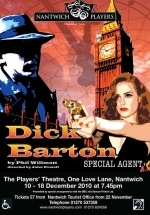 Tickets on sale at Nantwich Tourist Office (01270 537359) from 22 November.